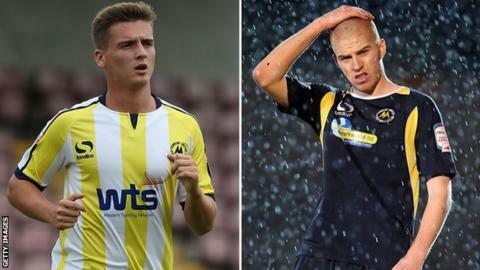 Torquay United manager Chris Hargreaves says he transfer listed youngsters Nathan Craig and Jordan Chapell because they were homesick. The 22-year-olds were among by Hargreaves after the Gulls' relegation to the Conference. "If someone doesn't want to live here and doesn't want to be in the area, then we've got a problem. Craig, who was a youngster at Everton, was from Welsh side Caernarfon Town. on a two-year deal last summer having impressed on loan the previous season. "Nathan's agent requested that he have his contract cancelled, he'd fallen out of love with football a little bit and was missing home really badly, he wanted to get back to north Wales," Hargreaves told BBC Sport. "Jordan wants to get back to closer to where he lives," added the Gulls boss. But with both players being under 24 years-old the club will be entitled to a fee for developing them should they move elsewhere. "If someone doesn't want to live here and doesn't want to be in the area, then we've got a problem," said Hargreaves. "With Nathan being under 24 I have to protect the club's interests because he's an asset to the club, if he wants to leave and he's not happy in the area I don't want him to be here and be unhappy. "But I've got to protect the club's interests, so unless somebody comes in for him or we arrange a hefty sell on fee, it's got to be right. "I put Jordan on the transfer list because if it works for both him and the club, then great, but again he's under 24 so it's got to be right for both parties."